Home Sailing Tips Which Dinghy is Right For Your Boat? Which Dinghy is Right For Your Boat? 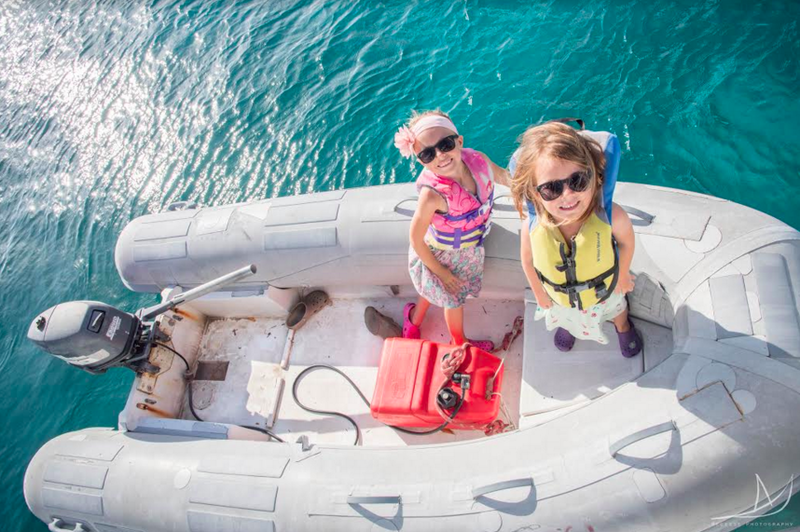 Whether or not you own your own boat or prefer to charter a yacht, a dinghy can be an important factor to consider when planning your next boating experience. Our guest blogger and fellow sailor Genevieve of the popular sailing blog, It’s a Necessity, shares her tips for choosing the right dinghy for your boat. 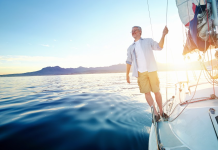 From outboard engines to heavy duty hard dinghies, learn more about these handy boats below. The Stolz crew getting ready for another adventure on their dinghy. Just like your boat, the type of dinghy you chose is completely up to personal preference. A dinghy is a major component in your sailing adventure, and something that should not be overlooked when you are buying your dream boat. Anticipate 3-7k to get something workable. That may seem like a large expense, and it is, but it is a necessary one if you want to enjoy yourself to the fullest. 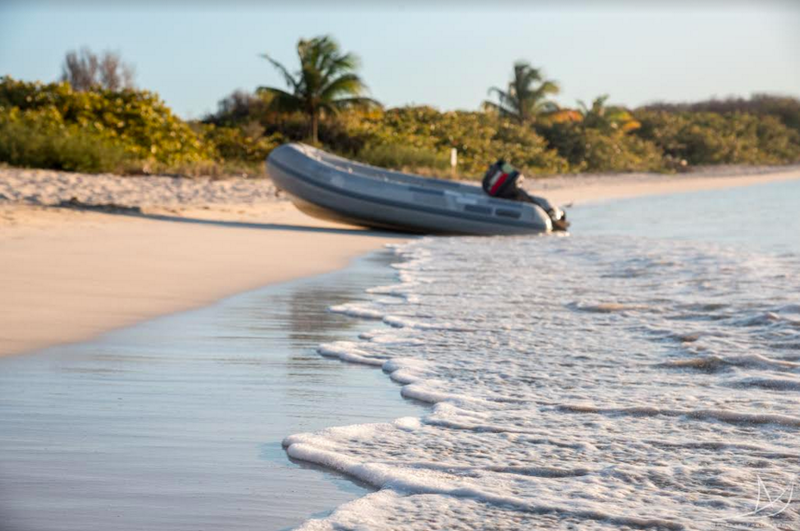 The most standard setup we have seen for Caribbean cruisers out on the water is a 10ft dinghy with a 15hp outboard. From there you have lots of leeway to see if you feel your next dinghy should be larger or smaller. After our 6 years on the water, and trying a few different types of dinghies, we have definitely found what works for us. If you are in the process of trying to chose your next “ocean car” here are some important questions you should ask yourself before investing the big bucks. What are your hopes for your dinghy? Will you always be anchoring a large distance from shore? Do you plan on doing any type of excursions on the water? Will you be spear fishing? Do you plan on hauling groceries and water over longer distances? If you answered NO to the above questions then a rowing or sailing dinghy may work for you. However, if you had hopes of doing any of the above and don’t want to make the to-and-from part of it an extreme workout, then you may want to get yourself an outboard engine. Even if you are a “purist sailor” at heart, you don’t necessarily want to miss out on any events because the distance is too much to handle in your wind-powered dink. We sometimes like anchoring off on our own, or sometimes just have any other option. We like going on adventures, like a 7 mile dinghy ride to find flamingos, we like that Eben can dinghy out a distance into the ocean and spear our supper. And yes, we have hauled both water and groceries over long distances. For our family, a rowing dinghy would not have been enjoyable. And I honestly don’t think I would’ve had the patience to do it with my two kids in the boat with me. So outboard it is. What size fits on deck or on your davits? 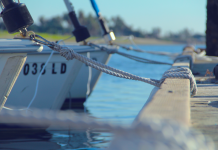 Over longer crossings you will most likely have to haul your dinghy up on deck or up into your davits. How much space will that allow? If you don’t have davits, how much of your deck space do you want taken up by a dinghy? 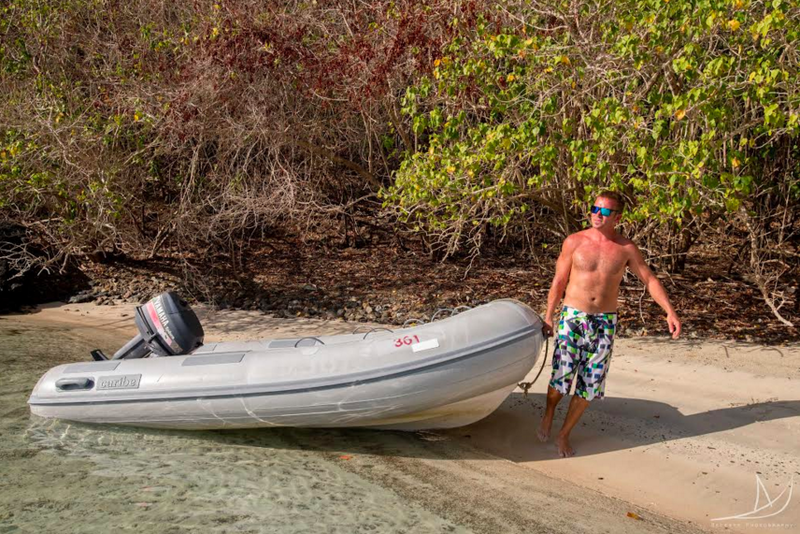 How are you hoisting your dinghy and how much weight can you handle? We have had both a 33ft sailboat and a 41ft sailboat. Neither of them had davits and so the dinghy had to fit on deck. We don’t do much walking around on deck while we are underway, other than if a sail needs to be manhandled, so we could care less if our dinghy took up the whole thing. To hoist it on deck is a two person job for us. We first have to remove the outboard and hoist that up on deck with our main halyard, and then with the halyard, the winch, and a lot of muscle, we hoist the dinghy up. Of course, we try to do this when the wind is down because it does require one person to be winching and the other to be pushing the dinghy off of any lines, the mast, and your fellow hoister, as well as maneuvering it into its resting spot. Sometimes we switch out who does what job, and neither of them are easy with a 12ft dinghy. Thankfully we only do this for longer crossings, and in the Virgin Islands where we currently are there isn’t much of that! How many people will you be shuttling around? Think about your family, and then think about the possibility that you may have a few extras from time to time. You will most likely have guests coming to visit you at some point in your sailing adventures, so you may want to have a some extra spaces in the dinghy for some extra tushies. Or be willing to do multiple trips if the space is just not there. From personal experience we have had friends pile into our dinghy on many occasions because ours was bigger and more powerful, hence able to make the distance faster and easier than say, a mini dinghy with a 2 horse engine. 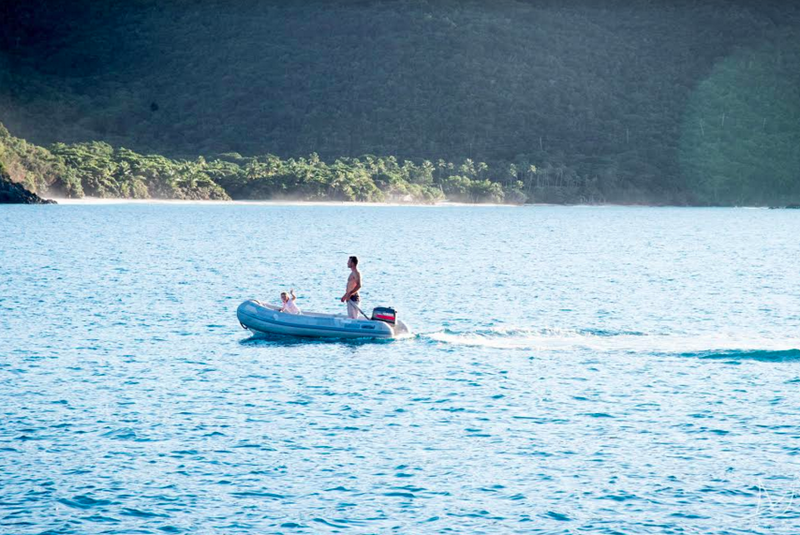 If you want to go discover a new beach, or check out the island, “jump in our dinghy”! What comfort level are you looking for? When you sit in your dinghy are you ok with sitting on a bench or fiberglass, or would your bum prefer to be sitting on an inflatable? Are you comfortable with driving a tiller, or would you prefer a centre console? Are you able to pull start the engine or will you need an electric starter? How much stability do you need the boat to have when you are walking around in it? All of these questions come down to your personal comfort. We don’t have davits, or enough expendable cash, so that eliminated the centre console idea. When we had our hard dinghy I found the bouncing off the waves hurt my neck (and my bum! ), and I did not feel as stable in it. So we prefer an inflatable. For the first two years I thought I wasn’t able to pull start our 25hp engine, and had to be chauffeured around by Eben. This was hugely annoying, for both of us, and I dreamed of having an electric starter. But then his sister came to visit and she managed to start it, so I thought, “If she can do it, I can do it!” and I did! That’s no longer an issue. What are you repair skills? Are you willing to invest the time in learning? Or the money in repairs? Both our hard dinghy and inflatable dinghy required to be worked on at some point. And luckily for us Eben has the skills to do both fiberglass and hypalon/PVC repair. He was self taught, and has been able to fix every issue that came our way. He got so good at it that many others have asked him for his help! The work doesn’t stop at the dinghy either, your outboard will also need attention. You either have to be willing to take the time and learn how to do it yourself, or you will have to dish out the cash and have someone else do it for you. This is inevitable, unless you decide “screw the dinghy we’re swimming everywhere”. For us, we have loved having a 12ft inflatable dinghy, with a 25hp outboard. This may be a bit much for a lot of people, but for us it has been perfect. Our current dinghy is a Caribe. We got it because that was the best “used” dinghy we could find available to us in the VIs. But Eben’s favourite are the AB. One thing we do love is having BIG tubes, as they minimize the amount of splash. That may seem foolish. But wait till you are walking around the island looking for the grocery store and you have a completely soggy bum. Not cool. Our outboard is a Yamaha Enduro. We LOVE it. It has lasted us forever, it is strong, and causes us barely any headaches. Barely! There have been times when the weather was “too choppy” for other people to make it ashore, not us. If we ran out of something we can make it to the grocery store in pretty much any weather. When we first got Necesse she was engine-less. We had to use our dinghy to hip-tow her through cuts, twice, until we could get the engine repaired. If you are staying anywhere near other boats you will most likely see this once or twice; another boater whose dinghy has failed them. Maybe it ran out of gas, outboard’s not working, or other mysterious causes. It’s nice to be able to offer them a tow back to their boat or to shore. In Georgetown, Bahamas there have been a few occasions where squalls came through and anchors started dragging and boats started drifting. It was great to see boaters band together and go help the boats in distress. Having a larger dinghy helped bumping the boats to safety, helping them steer, or being able to race to shore in bad weather to retrieve the owners of the drifting boats. For more sailing tips and other advice that may be helpful for your next boat trip or sailing holiday, click here.